Summer doesn't officially start for another few weeks, but in South Texas it's been summer since February and THE HEAT IS ON! (*makes a sassy '80s saxophone sound*). 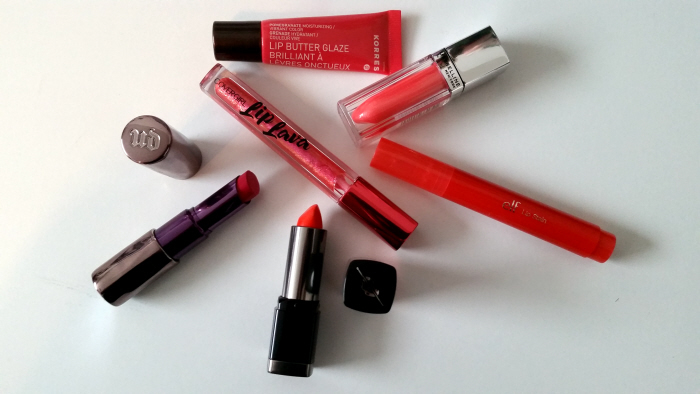 While I break out the shorts and stock up on pints of Chunky Monkey ice cream, it's time to take my bright summer lipsticks and glosses out of hibernation. I have such a die-hard attachment to bright lipstick that it took all my strength not to wear them in the winter time, when I'm supposed to be piling on the 'elegant, reflective, and cerebral' look of my wine colored lipsticks. This year I decided to treat myself and buy some new bright colors just because sometimes you have to pamper yourself to get yourself out of bed in the morning, ya know? Rise and shine to these colors. Out of the bunch, this is my favorite right now. When applied Makeup For Ever's Rouge Artist in 40 gives off the appearance of if you put Doritos Nacho Cheese dust on your lips. It's SUPER orange, and not those deceptive "red-oranges" that makes me question the color wheel. It was the exact orange I was looking for. If applied with a light hand you've got a nice orange stained lip that mirrors those childhood days where you would put Kool-Aid powder on your lips to give the impression you were wearing lipstick (what just me?) and the baby powder fresh scent of the lipstick further aids to the nostalgia. Still it's BRIGHT so I suggest for a subtle pop of neon that you apply with caution. Once upon a time my local Sephora did a mean thing when they stopped carrying my Cherry Oil Lipgloss in Rose 22. Blinded by betrayal, I picked up their Lip Butter Glaze in Pomegranate and tried to hide the hurt in another rosy orange. I believe this is one of their "sample sized" releases of it, but it has --- and I'm telling on myself --- lasted me for about two years. I know that's sooo groooossss and goes against the rules of make-up mavens, but it hasn't gone runny and doesn't smell bad, also I'm one of those weirdos who wipes off my lipgloss tubes after they become a little too cluttered with lip crud, and thus it kept well. This summer is probably going to be its swan song and "Taps" will have to be played, but right now its standing up like Lieutenant Dan on new stainless steel legs and going strong so who knows? Its ridiculously moisturizing and doesn't get sticky or goopy when you apply or wear it throughout the day. Just that it's not Ritz cracker proof. 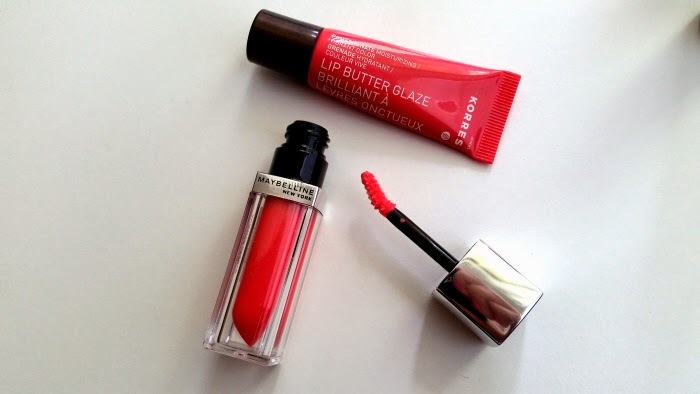 Oh, how I long for a cracker and potato chip proof lipgloss! Maybelline's Color Elixir is a deceptive little minx because when I bought it at Wal-Mart I thought it was a lipstick due to its container, but when I uncorked it surprise! it was a lip gloss with brush. -__- I was a little disappointed by that considering I'm trying to wean myself off my beloved glosses so I can be more ~adult~, still its a potent little lipgloss following in the brand's promise to be 'hyper-pigmented' while delivering "the color of a lipstick, the cushion-y care of a balm, and the glass shine of a gloss". They weren't lying, but my color in Breathtaking Apricot is a little paler than I initially thought it was...like I said, deceptive little minx. It has a nice sugar cookie smell, and does look nice whenever I want to give my bold matte brights a break. 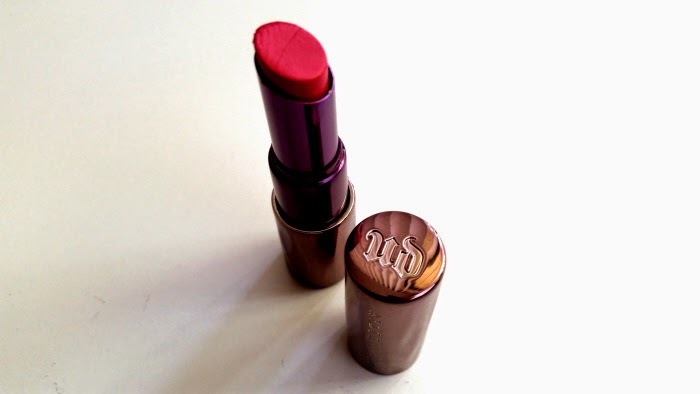 Urban Decay's Revolution Lipstick in Catfight is the lone pink in my cache which is surprising since pink lipstick is what I always wear. Still I usually only wear light pinks, not wild creamy fuchsias. Catfight is as fuchsia as it wants to be and doesn't shy away from bringing that pop. I suggest wearing muted colored clothing for a much more intense presence, but you do what you want. Once again I was drawing some inspiration from Hart Of Dixie as the character of Annabeth Nass (played by Kaitlyn Black) wears the heck out of some fuchsia lips from time to time, giving off a 1950s glamorous vibe with the spunkiness of a 1980s pop princess. Purchasing E.L.F. 's Lip Stain was a happy $2 accident, as I was looking for a more pinkish-red, but I should've known from a label reading "Hot Tamale" that it is a little more on the orange side, duh. Still I l-o-v-e stains and feel they are underrated in the lip color world because they are so effortless and elegant at the same time. 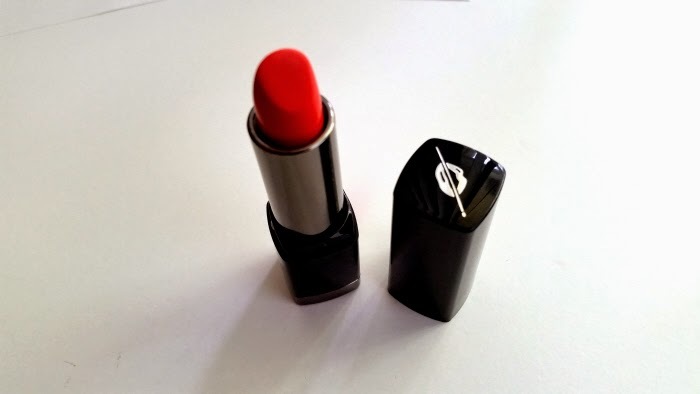 This one is a reddish-orange that does apply really well and lasts for several hours on, but if you're not used to stains it is a little drying at first and does feel like your rubbing a Crayola marker on your lips. It's better as a liner if I do say so myself, but for $2 you get a decent stain that is big on color and long lasting in wear. 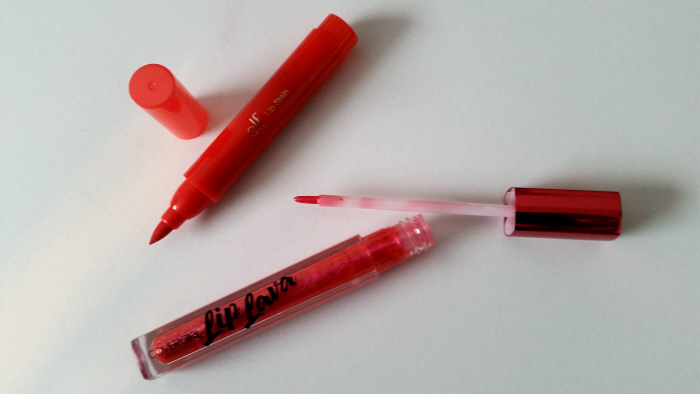 I think I love CoverGirl's Colorlicious Lip Lava packaging more than the color itself. Putting on Lychee Lava I was a little disappointed at how it was just a clear shimmer, with just a hint of the reddish orange-yellow swirl that is its color. The packaging (which my pictures do not do justice) makes it appear like high octane liquid chrome, and it's metallic and beautiful, but then when you apply it's like "yay...shimmer." Not the grandest sparkle at all. Still it's a very prismatic shimmer that is perfect for layering purposes, and I'm betting it'll probably look amazing over Hot Tamale, plus it stays on quite well and keeps your lips soft and supple which is always a bonus. I plan to seek out the other colors in the collection because I'm a sucker for a shimmer gloss no matter how ordinary they've become these days.